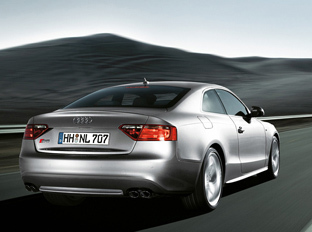 The Audi S5 is a high-performance version of the Audi A5 which first went on display at the 2007 Geneva Motor Show. As well as being more powerful the Audi S5 has more aggressive styling than A5, the radiator grille possesses the specific look of an Audi S model  painted in platinum grey and fitted with vertical chrome inlays. The front and rear bumpers have a more pronounced outline and the air inlet grilles are more striking. The aluminum-look exterior mirror housings make an overtly sporty impression, as do the color-keyed door sill trim and the dual-branch exhaust system with four oval tailpipes. Nevertheless, the model's sporty attributes always have a functional aspect: for instance, the more pronounced spoiler in the boot lid yields additional aerodynamic downforce. Inside the Audi S5, the sports seats, sports steering wheel, instruments with grey dials and aluminum door sill plates provide a dynamic and refined atmosphere. The program does, of course, provide ample scope to fulfil individual interior design wishes: the inlays are one example  here the choice is between carbon, aluminum, stainless steel or wood. 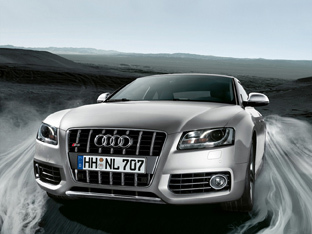 Power for the Audi S5 comes from a 4.2 litre V8 with a rated power output of 260 kW (354 bhp). Its peak torque is 440 Nm, which it delivers at 3,500 rpm. Within just 5.1 seconds the Audi S5 can sprint to 60mph. The Audi S5's sports suspension is tuned to enhance the coupé's performance with particularly dynamic handling. The special high-performance brakes, recognisable by their black painted brake calipers, always ensure precise deceleration. And finally, the ESP electronic stabilisation program can be deactivated in two stages whenever the driver wishes to exploit the potential of the Audi S5 to the full on a suitable stretch of road.